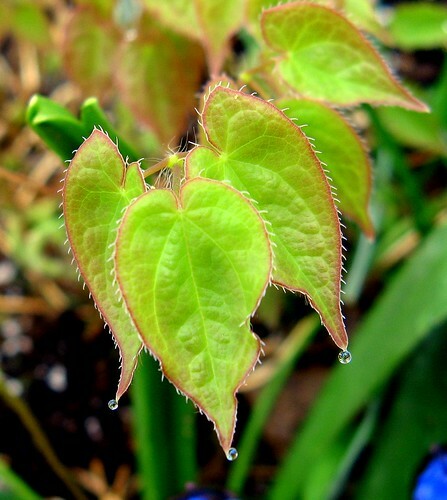 epimedium dripping, originally uploaded by jahansell. I'm trying not to do too many flower photos (though it's hard this time of year)!- but the water dripping off the new epimedium leaves just caught my eye! I ove this plant, the leaves are so lovely. We have a yellow flowered form; the flowers are so delicate like miniature daffodils. Oh this is a nice macro shot. I really like this. A long time I didn´t have time to look at your blog, now I open and wonderful this picture!!! makes you feel so small when you look at this, and how BIG nature is, each bit of it. Beautiful shot--you want to keep looking, waiting for the droplet to fall. You were quite right to share this. loveitloveitloveit! What a great capture. Love how you captured the little details.